The food and drink market is particularly saturated with both well established and newly emerging brands and products. To get your product and voice standing out amongst the rest it imperative you have set in place a strong integrated communications strategy that speaks directly to your target consumer. The following tips and advice provides an overview of the ways in which you can raise your brands profile within the media and amongst consumers. One of the most effective ways of elevating a brand or product in the media and amongst consumers is through successful product placement and journalist reviews. Being named in a “Ten best of” or “Five hot new products” style feature can give your brand huge credibility and exposure and can have a big impact on sales. But how do you get featured? An example of a successful food product placement is our campaign for Balance Box. We were tasked with launching the healthy eating delivery service and increase sales. The campaign focussed on product placement and reviews and from this we generated nearly 100 pieces of coverage and significantly increased sales. Another fundamental part of raising the reputation of a food and lifestyle brand is through engaging social media content. A great way engage followers is to establish regular content creation, for example ‘tip of the week’ or ‘fun fact Friday’. Adhoc content like Twitter Q&A’s are also a fantastic way to get your followers interacting with you. Creating a three-month calendar will also help ensure all social channels are kept up-to-date and in line with the PR plan. It is also vital that the tone of voice across all platforms is in-sync, therefore allocating either one or a selection of people to post content is recommended. To increase LighterLife’s social media and online presence, with the wider objective of driving sales and acquisitions for the brand we created a comprehensive strategic social media plan. Our strategy included a combination of motivational social media updates, video podcasts, inspiring blog posts, competitions and monthly Twitter Q&As with expert Dr Hilary. Our social media campaign had a huge effect on LighterLife’s business; we grew the Facebook channel by 233%, Twitter by 58% and blog views by 315% which resulted in over 8,000 social media acquisitions. Celebrities are an extremely powerful commodity when it comes to selling products, in particular for food and drink. When looking to work with a celebrity it is important to first think about the difference between a celebrity ambassadorial role and celebrity endorsement. A celebrity ambassador will become the face of the brand, and will usually be contracted to doing a number of interviews, photoshoots and events. This is normally the most costly option, but it does offer a brand a lot more scope than targeted celebrity endorsement. We sourced and appointed Pauline Quirke as the face of weight loss company LighterLife. Through this partnership and the press surrounding it the brand recorded the highest number of client leads to date, and conversation surrounding the brand increased seven fold. Pauline was contracted to lose a certain amount of weight using LighterLife and we negotiated a number photoshoots and press interviews which in turn achieved more than 30,000 new client leads for the brand. We achieved more than 150 pieces of quality coverage for LighterLife and over a nine month period we achieved more than £3.3million (AVE) in coverage for LighterLife. Targeted celebrity gifting can be a much cheaper, if not a free, way of generating celebrity endorsement. In order to get a celebrity to talk about or endorse a product, it must be either beneficial for them or something they believe in. Therefore brands must think about the right celebrity for their product. 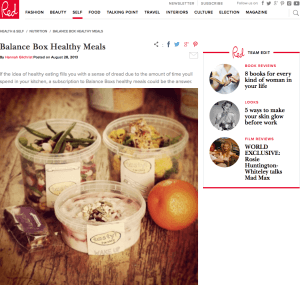 We approached Caggie Dunlop and Francesca Hull from Made In Chelsea with a Balance Box food plan trial as we believed the delivery service would benefit their busy lives, and both had expressed a desire to eat healthy. Both Francesca and Caggie enjoyed the Balance Box service and agreed for their names to be mentioned as fans. Take a look at a review piece we generated in new! Magazine that details both celebrities are fans. Press events allow you to interact with journalists, develop relationships and ultimately create brand ambassadors who could become hugely valuable. Press launch events for a food and drink product in particular, allow brand representatives to discuss the idea behind the product, the ingredients and components and also gives journalists the opportunity to try the product out first hand. To create a buzz around the newly re-launched Great British mixer brand Silver Spring 1870, we devised the concept of an ‘Around the World with 1870’ event, designed to celebrate the exotic ingredients present in each of the mixer variants. We created five individual bars, representing each of the 1870’s flavour varieties and journalists were invited to sample each of the mixers and learn how the product differs from its competitors. This event was extremely successful and saw over fifty key consumer titles feature news of the re-launched brand which in turn positively affected the sales of the product.